Latin : Ophiostoma ulmi (Buisman) Nannf. An integrated disease management plan can reduce the intensity of an outbreak of Dutch elm disease if it is implemented rapidly (Euale et al. 1977). The outbreak progression is mainly tied to the state of the populations of bark beetles that vector the disease. The two main vector insects are the smaller European elm bark beetle (Scolytus multistriatus) and the native elm bark beetle (Hylurgopinus rufipes). The disease management program must include sanitation measures aimed at reducing the size of the bark beetle population. All diseased trees should be felled and destroyed to keep beetles from using them as breeding sites, since otherwise they could likely pick up spores of Ophiostoma novo-ulmi and transmit them to healthy elms. In addition, all dead or dying elms or diseased wood that bark beetles could use for reproduction should be destroyed (Direction de l'environnement et de la protection des forêts 2003). Chipping or grinding of stumps is also recommended. Wilted branches should be pruned from all elms to reduce potential inoculum sources and breeding sites for bark beetles. When possible, final pruning cuts should be carried out 3 metres below the point with visible sapwood discoloration. Cutting tools that come into contact with diseased wood need to be disinfected (Thibault 1993). Felled trees should not be kept for firewood unless they are debarked and checked for bark beetles. Burying or burning is the best way to dispose of pruned or felled material (Direction de l'environnement et de la protection des forêts 2003). Once the fungus has become established in a stand, complete eradication is almost impossible. An elm monitoring program should be implemented to ensure early detection of infected trees. Qualified inspectors should make several inspection visits between May and August. Early detection of diseased elms can help reduce losses significantly. Diseased trees can be pruned or cut down anytime during the year. Healthy elms should not be pruned before the end of July, because the elms are more susceptible to infection during this period. Furthermore, the fresh wounds would attract bark beetles that vector the disease (Byers et al. 1980). Actually, it is recommended to prune healthy elms late in fall or only during winter. If an elm tree were inadvertently wounded (e.g. after pruning) in spring, the injured tissues should then be covered with an appropriate product. Pruners should use aseptic methods in order to avoid spreading the fungus, as described in standard NQ 0605 200/2001 (arboricultural and horticultural methods) published by the Bureau de normalisation du Québec ([Anonyme] 2001). 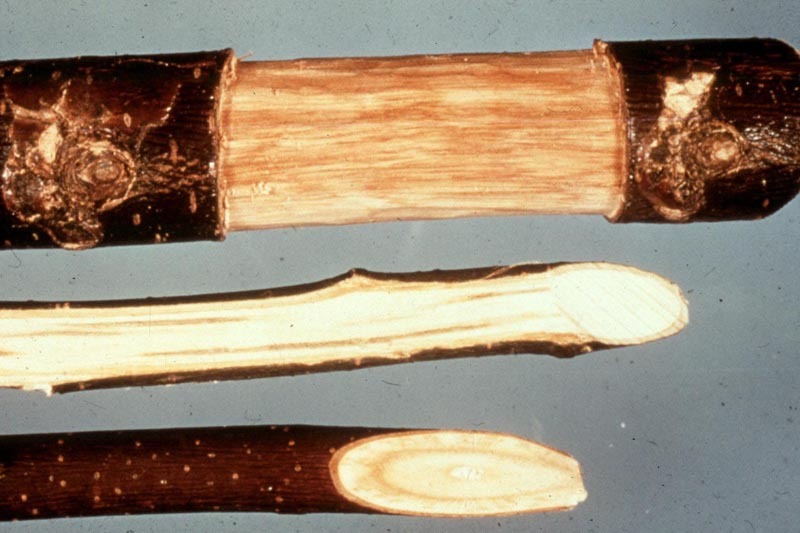 DED can spread from a diseased elm to adjacent healthy trees through root grafts, particularly when the elms have been multiplied as cuttings from the same parent tree. A few weeks after a diseased tree is felled, any root connections between it and other elms within a 15-m radius should be destroyed. 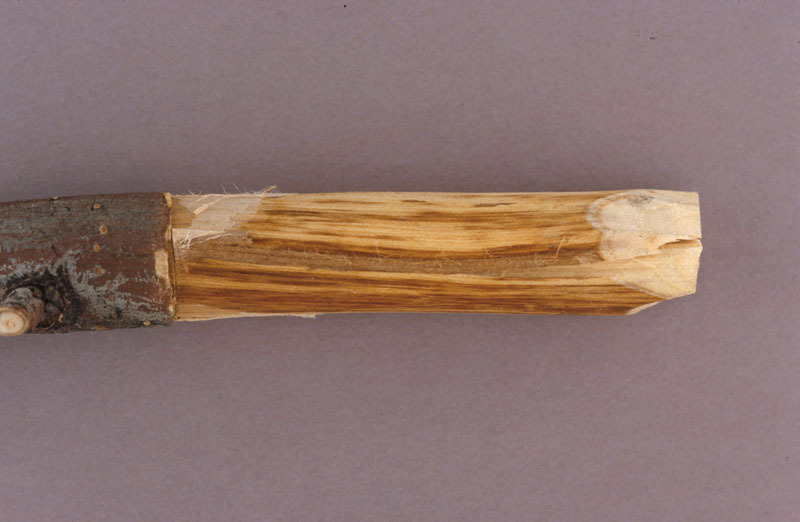 Root grafts can be severed by digging a trench at least 1 metre deep midway between the diseased elm and adjacent healthy ones, using a trenching machine or a vibratory plough (Mizicko, and Steinstra 1977; [Anonymous] 2000). However, this kind of deep trenching may not be feasible in cities and residential neighbourhoods because of various obstacles, such as sidewalks and water mains. Root grafts between diseased elms and apparently healthy elms should be destroyed, as well as the root grafts between the later and the second row of apparently healthy elms. Sticky traps installed on trees 3 metres up the trunk can be used to monitor the native bark beetle population. Chemical control of Dutch elm disease (DED) has two targets: the insect vectors and the fungus. As an initial step, insecticides can be applied to elms to kill the bark beetles. Over the years, various insecticides have been used depending on the specific requirements set out in the regulations. Spraying the base of trees (4 m) in early fall (before mid-September) helps keep native bark beetles from emerging at the end of winter and feeding on healthy trees. Although chemical control of the smaller European elm bark beetle could be achieved by spraying the entire crown with insecticide in the spring, the releases to the environment would be too great, making this approach environmentally unacceptable. In areas with large bark beetle populations, the use of trap trees may be beneficial for reducing beetle numbers. With this approach, a lower-value tree is killed by girdling the stem or by using a herbicide and then the bark is sprayed with an insecticide such as chlorpyrifos. The dying tree will emit chemical scents that attract bark beetles seeking egg-laying sites. Alternatively, an elm can be baited with an attractant, such as aggregation pheromones, to lure bark beetles (Lanier and Jones 1985). The trap tree's drying bark will keep the larvae from emerging (Lanier et al. 1988). Beetles that enter the tree or try to leave it will come into contact with the insecticide and die. Sometime in the winter after this treatment, the tree can be cut down and burned to destroy any surviving bark beetles. An additional benefit of this treatment is the killing of beetle brood colonies, significantly reducing the potential for future infection. The use of pheromone-baited traps has never been found to be effective in reducing significantly the incidence of the disease (Scheffer et al. 2008). Injecting fungicides can be an effective method for protecting valuable elms. This method can be preventive and curative. The chemicals used are designed to prevent the fungus from infecting trees or from spreading within newly infected trees. However, this approach is labour-intensive and requires special equipment. It is also costly because the fungicide must be distributed throughout the tree. The fungicide is injected into the tree through the roots, the root-flares or the trunk (Euale et al. 1977). Since this method injures the tree, it should only be used to protect high-value trees. Preventive fungicide injection is more effective than the curative approach to control Dutch elm disease ([Anonymous] 2000). If the injections need to be repeated annually, the cost of the management program will rise significantly. Also, fungicide injections are not recommended for elms with more than 5% crown dieback, and they cannot save trees infected via root grafts (Olson et al. [ND]; Scheffer et al. 2008). Root grafts may also be destroyed with chemicals. They must be administered by drilling deep holes into the infected tree and the trees to be protected. Fumigant applications to destroy root grafts should be used only as a last resort, when mechanical control is not an option (Mizicko and Steinstra 1977). Products registered in Canada for the control of the pathogen causing Dutch elm disease contain the following active ingredients: carbemdazim or thiabendazole. Moreover, metam is registered to destroy root grafts between infected and healthy elm trees. Chlorpyrifos is registered to fight against the native elm bark beetle. D-factors can be harnessed for the biological control of Ophiostoma spp.. These pseudo-viruses can decrease the aggressiveness of the pathogen by slowing its growth and development and lessening its ability to infect elms. It takes more fungal spores to infect a healthy elm when the fungus has been parasitized by d-factors (Sutherland and Brasier 1997). Transmission of d-factors is nonetheless hampered by vegetative incompatibility in the strains of Ophiostoma. Considering the low genetic diversity of Ophiostoma novo-ulmi in North America, this type of biological control should be feasible (Brasier 1996). Before this biocontrol tool can be used, a number of issues need to be resolved in relation to the mode of distribution of d-factors and product registration (Scheffer et al. 2008). Antagonistic bacteria represent another potential avenue for biological control of Dutch elm disease. The most promising bacterium in this regard is Pseudomonas syringae, which has been tested on elm species native to Europe (Scheffer and Strobel 1988). In addition to having strong antifungal activity, this bacterium has no known pathogenic effects on elms. The mode of inoculation greatly influences the degree of success achieved with P. syringae in preventing infection or symptom expression in elms. Recent research has shown that the protective effect of the bacteria varies with the elm clones treated. As a result, the observed resistance is now interpreted as a physiological response of the tree rather than the effect of antifungal compounds produced by bacteria (Scheffer et al. 2008). Studies have shown that host resistance can be induced by injecting a tree with a non-aggressive strain of Ophiostoma ulmi (Hubbes 2004). This inoculation induced resistance in elm against more pathogenic strains of the pathogen (Sutherland et al. 1995). The WCS850 isolate of Verticillium albo-atrum has also demonstrated a high level of efficacy in reducing Dutch elm disease symptoms and mortality (Scheffer et al. 2008). A product based on this isolate is registered for use in Canada, the Netherlands and the United States. The best long-term prospect for disease management consists in selecting disease-resistant elms (Pomerleau 1970). Susceptible trees that are felled should be replaced with disease-resistant hybrids or unsusceptible species. Exotic elms, hybrid species (e.g. 'Accolade'; see below) and selected provenances of American elms (the most common species), Siberian elms, Japanese elms, and the cultivar 'Urban' (a cross between the Siberian elm and various European provenances) have recognized resistance to Dutch elm disease. A number of communities and countries have established programs to develop and select disease-resistant or -tolerant elms that are adapted to their specific climatic conditions. Efforts to select disease-tolerant or -resistant elms are ongoing with the aim of creating American elms tolerant to Dutch elm disease (Townsend et al. 2005). The cultivar 'American Liberty' has been strongly promoted by a U.S. organization called the Elm Research Institute; it is actually a hybrid made up of six American elm cultivars with varying degrees of tolerance to the pathogen. 'American Liberty' is the most widely planted elm at present. Other promising selections or cultivars ('Discovery,' 'Prospector,' 'Patriot,' etc.) provide the hope that elm trees will once again grace our city streets and rural landscapes. In North America, the cultivar 'Accolade' (Ulmus 'Morton,' believed to be a hybrid between U. japonica and U. wilsoniana), which is highly resistant to Dutch elm disease, is the most promising variety (Smalley and Guries 1993). Although smaller than American elm, its crown has an umbrella shape similar to that of American elm. In Canada, the University of Guelph leads the research to select resistant white elms adapted to our climate. 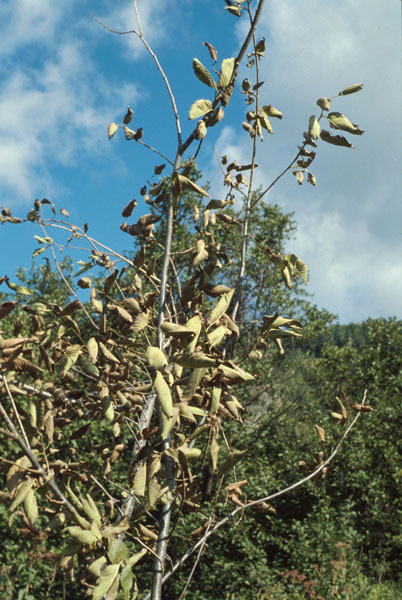 According to the Elm Recovery Project (Anonymous 2007), seeds of genetically resistant elms would be available in 2018, following 20 years of research and 70 years of selection pressure on elms in Canada. At present, Dutch elm disease cannot be completely eradicated once it becomes established in a stand. However, an integrated disease management program (Kondo 1982) can help reduce mortality to a level close to natural mortality. Plan a disease management program. Implement monitoring of elm trees. Assess the population density of the bark beetle species that vector the disease. Cut down all diseased elms. Destroy root grafts whenever needed, in particular when elm trees planted in a row are produced by cuttings from the same parents. Sanitation: carry out preventive pruning and cut down dead or dying trees. Reduce the size of the insect vector population by applying insecticides. Inject fungicides into high-value elms. Inspect elms on a regular basis, even when the disease level is low. Conduct additional researches on disease management. [Anonymous]. 2000. 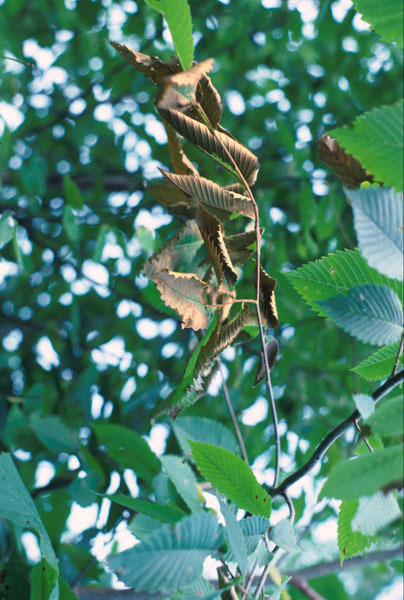 Dutch Elm Disease and its control. University of Illinois Extension. Report on Plant Disease No 647, 11 pp. Brasier, C.M. 1996. Low genetic diversity of the Ophiostoma novo-ulmi population in North America. Mycologia 88: 951-964. Byers, J.A. ; Svihra, P. and Koehler, C.S. 1980. Attraction of elm bark beetles to cut limbs on elm. J. Arboric. 6: 245-246. Direction de l'environnement et de la protection des forêts. 2003. Maladie hollandaise de l'orme. http://www.mrn.gouv.qc.ca/forets/fimaq/insectes/fimaq-insectes-maladies-hollandaise.jsp consulté en janvier 2008. Euale, L.; Gardiner, L.; Huntley, G.; Kondo, E., and Jago, L. 1977. An integrated Dutch elm disease control program for Sault Ste.Marie Report 0-X-268: 31 pp. Hubbes, M. 2004. Induced resistance for the control of Dutch elm disease. Investigación Agraria: Sistemas y Recursos Forestales 13: 185-196. Kondo, E.S. 1982. Integrated systems of control of Dutch elm disease in Canada. Pages 129-137 in Proceedings of the Dutch Elm Disease Symposium and Workshop, October 5-9, 1981, Winnipeg, Manitoba. Canadian Forestry Service, Forest Pest Management Institute, Sault Ste. Marie, Ontario, Manitoba Department of Natural Resources, Winnipeg, Manitoba. 517 p.
Lanier, G.N. and Jones, A.H. 1985. Trap Trees for Elm Bark Beetles Scolytus-Multistriatus Augmentation with Pheromone Baits and Chlorpyrifos. J. Chem. Ecol. 11: 11-20. Lanier, G.N. ; Schubert, D.C. and Manion, P.D. 1988. Dutch elm disease and elm yellows in central New York. Plant Dis. 72: 189-194. Mizicko, J. and Steinstra, W.C. 1977. Root Graft Spread of Dutch Elm Disease and its Control. University of Minnesota, Agriculture Extension Service, Minnesota Tree Line No 4-1977, 2 pp. Olson, B.; von Broembsen, S. and Royer, T. [ND]. Dutch Elm Disease and its control. Oklahoma State University, Oklahoma Cooperative Extension Service, paper No EPP-7602, 4 pp. Pomerleau, R. 1970. Perspectives de lutte contre la maladie hollandaise de l'orme. Phytoprotection 51: 63-71. Scheffer, R.J. and Strobel, G.A. 1988. 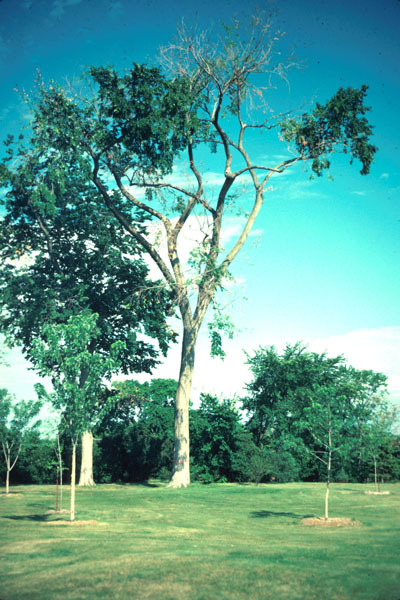 Dutch Elm Disease, a Model Tree Disease for Biological Control. In Mukerji, K.G. and Garg, K.L. eds. Biocontrol of Plant Diseases Vol. II. CRC Press, Boca Raton, Florida, USA, pp. 103-119. Scheffer, R.J.; Voeten, J.G.W.F. and Gurries, R.P. 2008. Biological control of Dutch elm disease. Plant Dis. 92: 192-200. Smalley, E.B. and Guries, R.P. 1993. Breeding elms for resistance to Dutch elm disease. Ann. Rev. Phytopath. 31: 325-352. Sutherland, L.; Mittempergher, L. and Brasier, C.M. 1995. Control of Dutch elm disease by induced host resistance. Eur. J. For. Path. 25: 307-318. Sutherland, M.L. and Brasier, C.M. 1997. A comparison of thirteen d-factors as potential biological control of agents of Ophiostoma novo-ulmi. Plant Pathol. 46: 680-693. Townsend, A.M.; Bentz, S.E. and Douglass, L.W. 2005. Evaluation of 19 American elm clones for tolerance to Dutch elm disease. J. Environ. Hort. 23: 21-24. Brown vascular staining caused by Ophiostoma ulmi in a white elm with Dutch elm disease. 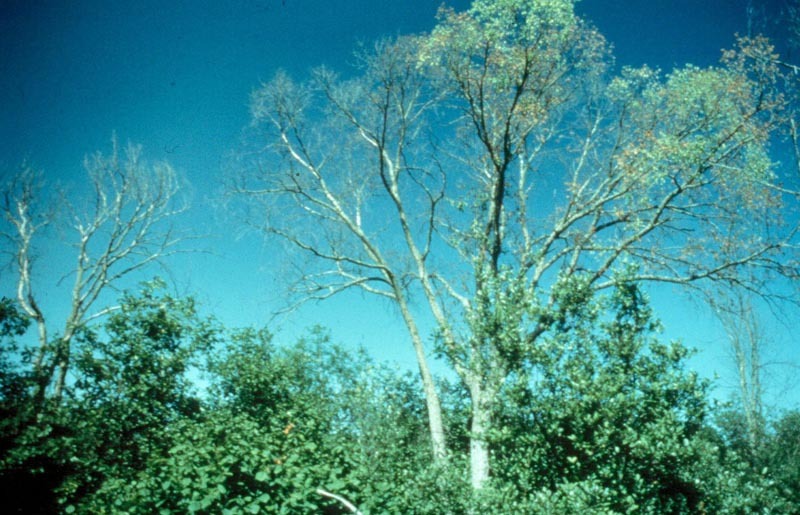 Wilt and dieback caused by Ophiostoma ulmi, the causal agent of Dutch elm disease, on a white elm.